Contrary to the name, these dogs actually originated in Africa and were known as African Hairless Terriers, however there is genetic evidence that shows a shared origin with the Mexican Hairless (Xolotzcuintti). On route to China, ships used for trading brought the dogs on board to hunt rats. They were renamed the Chinese Crested and the name has stuck and the Chinese also bred them to be smaller than when they arrived originally. 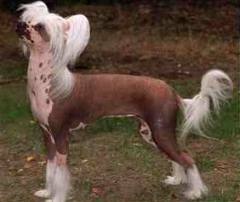 There are two distinct varieties of the Chinese Crested Dog, the "hairless" and the "powderpuff." Although many people think that these are two separate breeds, they are not. The hairless variety is just that: hairless, except for its feet, head and tail. The "powderpuff" has a long, soft coat. The hairlessness is an incomplete dominant trait within a single breed. The skin and coat can be any colour, and solid, mixed or spotted all over. Both hairless and powderpuff varieties can be born in the same litter. The Chinese Crested was recognized by the American Kennel Club in 1985 as part of its Miscellaneous class, and was accepted for full registration in 1991. They are lovely, energetic dogs that have a happy demeanour and seem to smile and even appear to ‘hug’, their person around the neck. They love people in general and have a tendency to become attached to their perferred ‘person’ and care must be taken as this can lead to over dependency and separation anxiety. It needs early and continued socialization as there is a tendency towards these dogs being slightly aloof or fearful if this is not done. They are great climbers and never seem to get tired of playing, whether its person, kids, adults or other animals. They do well in town houses as happy being inside and are generally quieter than other breeds and do not need extensive exercise. . They really are not the best watchdogs, but will bark if they feel threatened and also have a distinctive howl that seems to be used mostly when playing or having fun. Due to the coat (or lack thereof), care should be taken in colder weather and a dog jacket used. Always from a KUSA registered breeder or KUSA affiliated breed club. They do get on well with children, but care should be taken that the child is gentle with the dog, especially the hairless, as the lack of hair can lead to damage to the skin. They love playing and interacting with children. As with all dogs, a child must be taught to be ‘dog savvy’. As they were used originally for hunting rats, care must be taken around any rodent pets. They get on with most other dogs although care must be taken that if rough housing was involved, the hairless would not be hurt due to the lack of hair. The best combination is always male and female and both should be sterilized. Early and continued socialization required to ensure they do not become aloof or hesitant in meeting strangers. As these dogs are prone to attach to one person, make sure from the start that they cope being alone and with other people. Basic Training and House Rules should be implemented. A daily walk should be part of their daily routine. Powderpuff variety needs a lot more grooming and as the hair is very long and fine and has a wooly undercoat, care has to be taken that matting does not occur – which can happen easily if not groomed daily or every second day. This breed falls into the choices for allergy sufferers. The hairless variety can be wiped over with a soft cloth and bathed on a regular basis. There are creams available to keep the skin supple and often a sun screen is recommended – discuss this with your vet, as opinions vary. Gains weight easily; do not overfeed. Exposed skin on the hairless dogs needs special care to prevent skin irritations and sunburn.. The hairless variety is more prone to teeth problems due to their small mouths, so vet dental check a necessity as well as tooth brushing and tooth care. It has been found that there is a fair amount of allergic reactions in this breed, and the most common culprits appear to be lanolin and wool items. Make sure that if you are using a cream it does not contain lanolin. Chinese Cresteds can have breathing difficulties caused by a windpipe that collapses. It's essential to have your puppy's eyes examined annually by a board certified veterinary ophthalmologist, even if his parents were CERFed. The breed can also suffer from a condition known as "dry eye," so if you notice his eyes seem irritated, consult your veterinarian. Chinese Cresteds are prone to luxating patellas, where the kneecap slips easily out of place as well as thyroid disease. Your Chinese Crested may also suffer from Legg-Calve-Perthes disease. This condition causes reduced blood supply to the head of the thigh bone, which in turn causes it to shrink. The first sign of this disease is limping, which usually appears when the puppy is 4 to 6 months old. Chinese Cresteds should also be genetically tested for thrombopathia and have von Willebrand’s factor antigen testing, which can be done by any veterinarian, to screen for these bleeding disorders that occur in the breed.